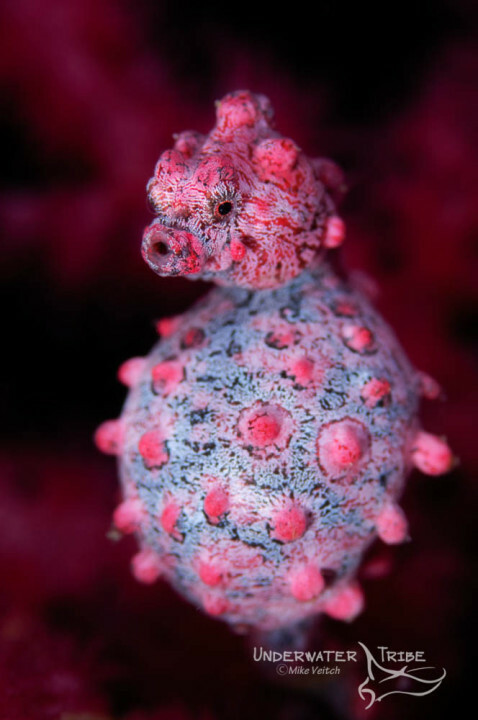 One of my more popular photos, the Pregnant Pygmy Seahorse, was taken in 2010 at Cannibal Rock in Horseshoe Bay, Komodo National Park, Indonesia. After spotting this pygmy seahorse a few days before, I made a mental note to prepare my camera for “super macro” for my next visit to the area. In all honesty, I didn’t expect this particular seahorse to still be so “pregnant” looking when I arrived 5 or 6 days later but I was more than happy to see it was still in this condition when I arrived. When shooting “super macro” I use a Nikon 105mm lens coupled with a Kenko 2X Teleconverter which creates a 210mm lens. However, as I was using a crop sensor camera this setup has macro capability of about 2.5X lifesize (with my basic math). Shooting with a teleconverter (TC) is extremely annoying as the autofocus takes a very long time and will “stutter” at the slightest movement of the button. Therefore, the best way to shoot when using this setup is to preset the lens to manual and “rack it” all the way to minimum focus distance before putting it in the housing. This way the lens is set to its optimum “super macro” setting and will be able to take photos quickly without the issue of the auto focus losing focus. On this photo I waited patiently beside the seafan and rocked gently back and forth with the lens until the pygmy was in focus before taking any photos. A lot of time and patience was spent (I won’t mention my deco obligation) on this set of images while waiting for this notoriously shy subject to turn toward the camera. 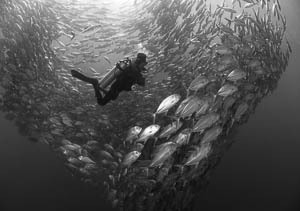 With the sudden surge in popularity of Black and White images on Facebook and other social media, it’s time to post this article that Mike wrote for Scuba Diver Australasia magazine in 2008 for the “In Focus” column. The format and photos are not necessarily the same as the magazine layout. Enjoy! If I’m presented with a series of art prints it’s always the classic black and white photo that stands out. 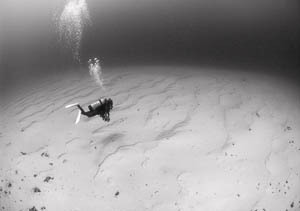 Check the Web or flip through some diving magazines and you’ll notice a lack of underwater black and whites though. Why is that? Several reasons: Cameras are set up to shoot colour images; folks don’t want to spend time converting to black and white in post production; and of course the underwater world is so full of rich colours, it may seem a waste to photograph marine life in monotone. 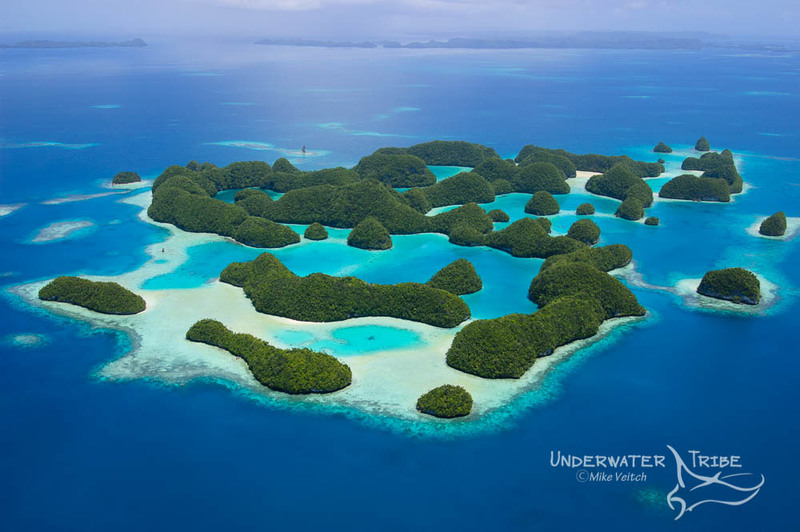 Seeing the underwater world solely in colour, though, is like going to Starbucks and ordering plain black coffee! Which means there’s a treasure of photographic opportunities awaiting the shooter willing to conceptualise outside the box. While Doug Sloss has already written about converting a colour image into black and white using Photoshop, I want to take a different tack. Let’s look at the “why, when, and where” of thinking in black and white. Not every subject in the water lends itself to shades of grey. Obviously, a bright red sea fan with numerous colourful crinoids and soft corals attached to it won’t be nicer if you capture it in black and white. 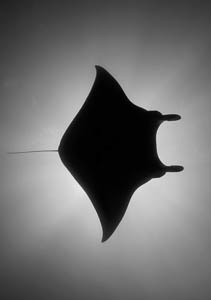 Instead, subjects with strong lines, contours, and shapes work well in black and white; examples include wrecks, wharf pillars, whales, and manta rays. But are these types of wide-angle subjects the only suitable subjects? Not by a long shot. By thinking outside the box, you’ll be surprised how many different subjects look great in black and white. Anemone bulbs, nudibranchs, schooling fish, fish portraits, and even coral reefscapes can be given a whole new look with a simple colour conversion. The key is to look for textures and shapes that are out of the ordinary. Take the humble anemone for example. Whereas most shooters will concentrate on capturing the antics of a playful anemonefish, look instead at the jewel-like details of the individual polyps. The play of shadows across the bulb tentacles creates a perfect abstract rendition of a relatively common subject. 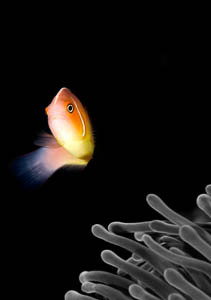 When using strobes to illuminate an underwater subject it’s very important to use them wisely. Using two strobes to evenly light the entire subject doesn’t give the opportunity to create hints and textures. Instead, varying the power of the strobes or using only one will create the dramatic light needed to cast fine shadows across the subject. Other subjects that lend themselves well to monotone are “charismatic megafauna” like sharks, whales, mola mola, and manta rays. Why would this be, you ask. It’s simple. Since all are pelagic in nature, they need to blend in with their environment in order to hunt or hide from predators, and as such utilise basic skin tones: grey, black, or white. However, their lines and shapes make them instantly recognisable to the average diver. Combining the sleek contours of a shark with the mysterious and subtle tones of a black and white image create a sense of mystery and awe. The same is true of mola molas – their grey skin appears bland against a blue background but contrasts sharply with the subtle grey of the open ocean when converted in Photoshop. The sheer size of a great whale is impossible to light with strobes and photos of them often tend to “wash out” toward the blue spectrum. A black and white conversion allows the strong aura of the whale to stand out better against a light coloured background. This leads us to the next advantage of colour conversion: the ability to save a slightly over or underexposed photograph or one that tends too much toward blue/green natural light photos. I have a number of photographs in my collection where I was too far from the action and my strobes weren’t able to illuminate colour properly. Shooting in RAW and using the white balance adjustment can often bring colour back to these photos, but I often try a black and white conversion instead. 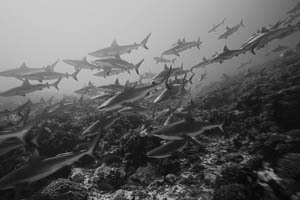 One of my favourite images is of a large school of sharks in French Polynesia. The original slide is a washed out blue/green because I was too far from the sharks. The subject itself was very appealing but the overwhelming blueness of the image made it an ordinary shot. By scanning it to digital and converting it to black and white I was able to save a once in a lifetime photo, and it now hangs on my wall. 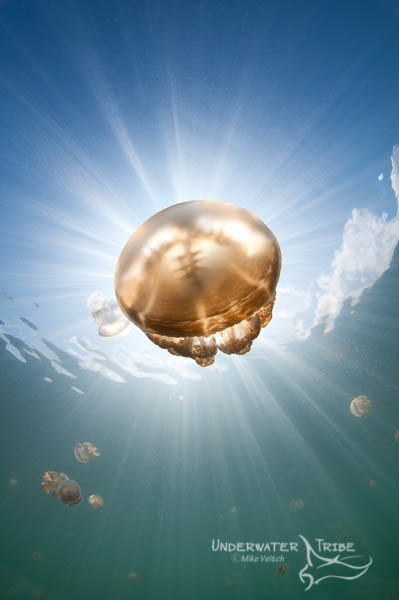 Some of the most dramatic underwater subjects aren’t fish but rather man-made objects. 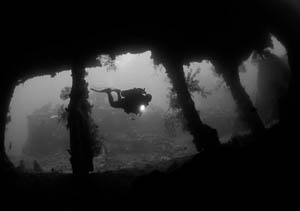 Diving on shipwrecks is a haunting experience for any diver. But capturing the essence of a lost ship lying on the bottom of the sea isn’t an easy task. Using the subdued hues of grey in a monotone image, the emotion and power of the final resting place ship is undeniably more powerful than the use of a bright blue background. The mood of what are often war graves is captured perfectly in black and white, and the subtle shadows create a deep feeling of mystery and emotion. Other man-made structures that work well in black and white are docks or piers. Shafts of bright light streaming through the wooden planks of a dock, or bursting from behind a series of pilings is an unforgettable image. Many of these objects are home to large schools of fish seeking shelter. 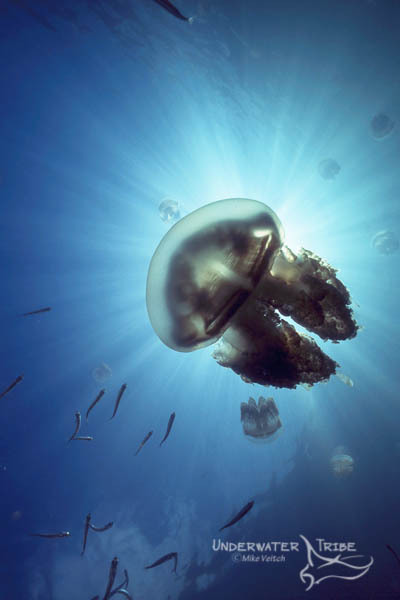 This added element of marine life adds a complementary “near and far” subject to the image. Be careful when shooting this style of photograph: The low light of morning or late afternoon works the best as the sun is low on the horizon, and won’t overexpose the whites in the background. One of the best rewards of a well-planned and executed black and white photograph is the end result of printing. The classic tones of such photos really stand out. We now have at our disposal a fantastic way to display photographs in a different way: on canvas. Many professional print shops offer digital printing on canvas at very reasonable rates. Taking a black and white photograph and having it displayed and framed on stretched canvas can help make that image into a timeless display of art. There are also a few exciting tricks that can be done in Photoshop to make your photo one of a kind. Consider leaving a portion of the subject in colour while converting the rest of the image to black and white. A small splash of bright colour against an otherwise grey background makes the composition stand out from the crowd.